PreSonus Forums • View topic - Project Tempo - Playback Bug??? Project Tempo - Playback Bug??? I primarily use studio one v4 for music transcribing. Below is my common workflow. All this works nice and does what I expect it to except for one thing, which I think could be a bug or a feature of the program that I would like changed. Let say I am inside a loop I created and its looping one bar of the song. All good, I put down some notes, at a slower tempo then I like to increase the tempo to normal and make sure it sounds good. When once I change the tempo of the project, the playback place goes somewhere else and I am not back on min 1 of the song even though my look is on minute 4. No major, I move it by hand to near or inside the loop and play the loop a few times again. Extend the loop to keep working on it, then change tempo and back to minute 1. Is as if I had a marker on that section and always went to the same section when I change the tempo. I do not have any markers on that section that I can visually see. I have restarted the program and laptop a few times with no solution. Has anyone experienced this? Anyone has any solutions? 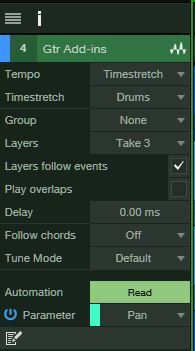 Re: Project Tempo - Playback Bug??? Tempo... which can be "Timestretch", "Follow" or "Don't Follow". You'll have to open the "Inspector" (F4) to view these. For more in-depth info on what they do, search for them in the Studio One Reference Manual (Alt F1) and the tutorial on YouTube.